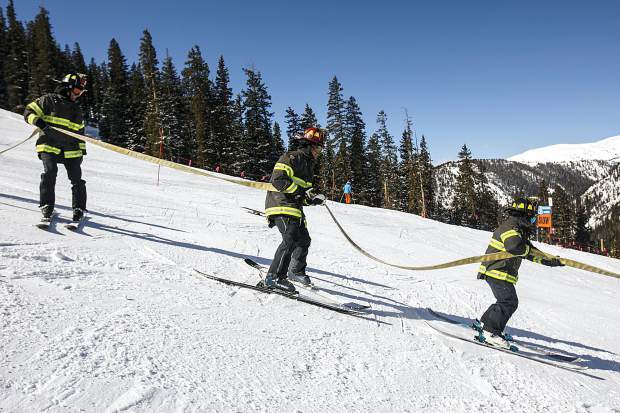 City firefighters from the Red, White, and Blue Fire Department ski on the course of 15 slalom gates during 12th annual Fire Hose Relay Race Friday, Feb. 23, at Arapahoe Basin Ski Area. 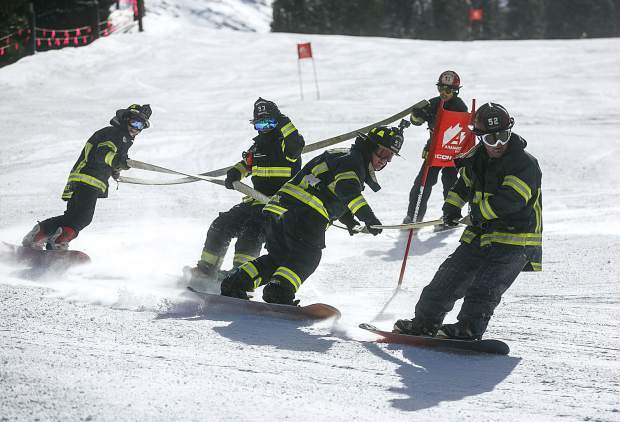 Red, White, and Blue Fire Department's team of five firefighters kick off their race by extending the fire hose to teammates before descending for the slalom gates in the 12th annual Fire Hose Relay Race Friday, Feb. 23, at Arapahoe Basin Ski Area. 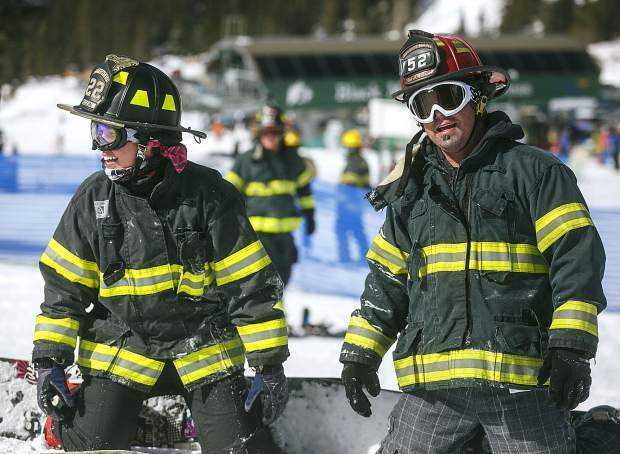 Brighton Fire Department firefighters on snowboards share a laugh while participating in the 12th annual Fire Hose Relay Race Friday, Feb. 23, at Arapahoe Basin Ski Area. 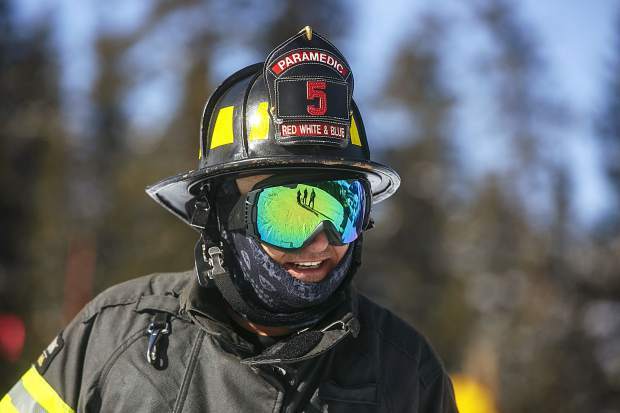 Red, White, and Blue firefighter smiles while participating in the 12th annual Fire Hose Relay Race Friday, Feb. 23, at Arapahoe Basin Ski Area. 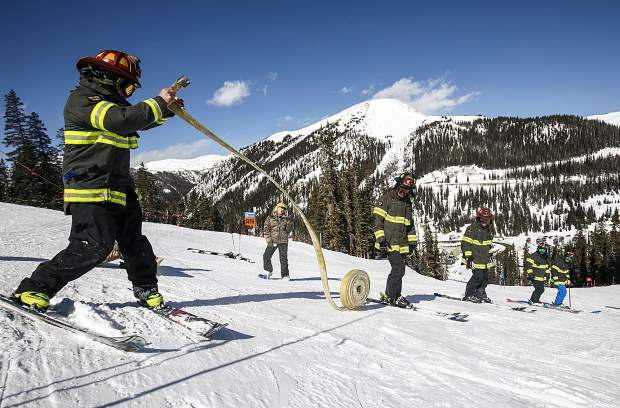 Brighton Fire Department's firefighters race around slalom gates on snowboards while holding a firehose in the 12th annual Fire Hose Relay Race Friday, Feb. 23, at Arapahoe Basin Ski Area. 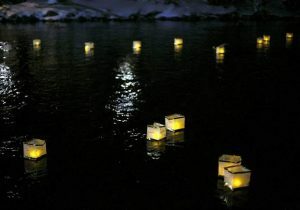 Red, White, and Blue Fire Department's team of five firefighters take off for the slalom gates in the 12th annual Fire Hose Relay Race Friday, Feb. 23, at Arapahoe Basin Ski Area. 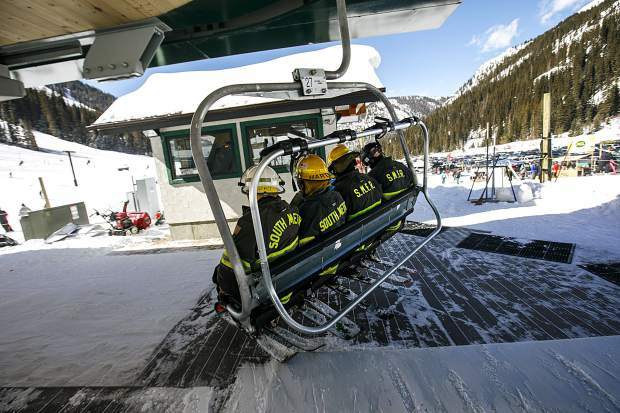 People in firefighting suits take off on a chairlift for the 12th annual Fire Hose Relay Race Friday, Feb. 23, at Arapahoe Basin Ski Area. 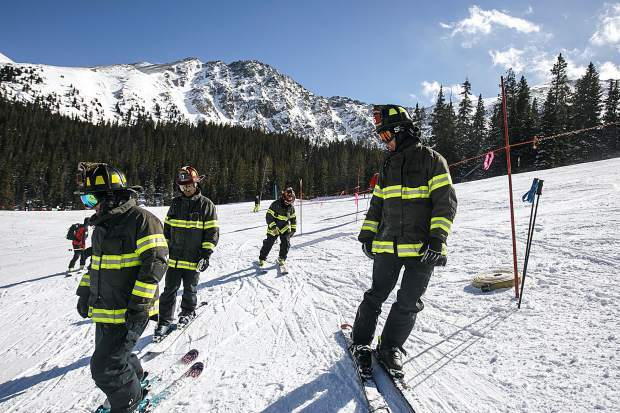 Red, White, and Blue Fire Department's interact before taking off for the slalom gates in the 12th annual Fire Hose Relay Race Friday, Feb. 23, at Arapahoe Basin Ski Area. 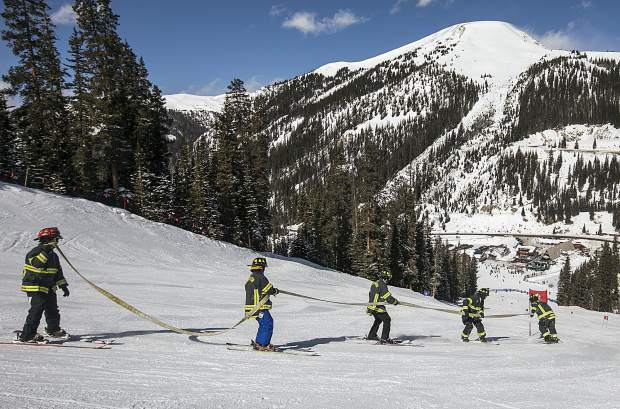 On Friday morning, teams of five firefighters raced down the mountain holding onto a 50-foot fire hose while zipping around the slalom gates on High Noon run at Arapahoe Basin Ski Area. 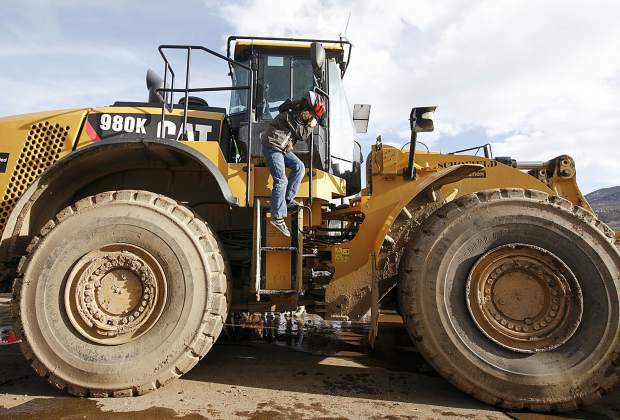 Exchanging heat-resistant fire boots for ski and snowboard boots, the firefighters from Colorado participated in the 12th annual Fire Hose Relay race, which is a fundraiser for the Burn Camps Program at The Children’s Hospital of Colorado. 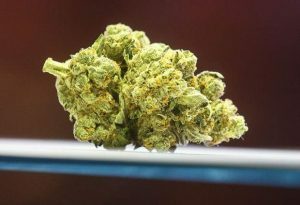 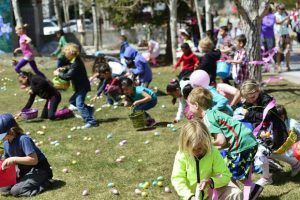 See more photos of Friday’s action online at SummitDaily.com.